2 x Photovoltaic panels integrated in the coachroof, 600 W, 12 V. Solar battery charge management system. The flagship of the Greenline Yachts family, Greenline 48 features all the benefits that Greenline Yachts stand for. 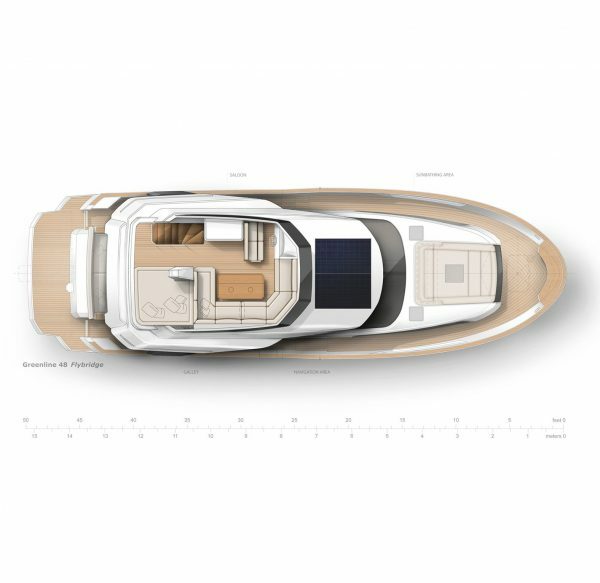 One level living concept ensures the movement on the deck is safe and effortless, ample AC power allows the use of normal home appliances onboard and solar roof makes sure you never run out of power. 240 (110) VAC power at all times enables extensive use of domestic appliances and recreates the comfort of your own home: use of a refrigerator (there’s room for a 270-litre unit), a microwave oven, TVs and AC.